It's also been difficult ordering the list of games this year, as I believe 2015 has been the year of the flawed gem. Even though many of the games are great, each has had a flaw of some kind that makes them less than perfect. I don't know if it's just the reviewer’s eye looking at the games with critical thoughts or if I am just becoming jaded but almost every game on this list is less than perfect, I'm not saying they're bad games, it’s just there seems to be an obvious flaw in most. It's impossible to play every game released in 2015, so some games naturally fall through the gaps and these are the notable games missing from this list. Mysterium - whether it's the Polish language version, Tajemnicze Domostwo, or the recent English translation, Mysterium has been one of the most talked about games of the year. Imagine a game of Cluedo (or Clue if you're an American) but one player is the ghost of the murder victim and must tell the players how they were killed via cryptic dreams. Pandemic Legacy - it's a game I have been looking forward to all year, the great Pandemic but played as a campaign. It's making a lot of bloggers Game of the Year lists and has just become the number one ranking game on Board Game Geek, but unfortunately it hasn't hit my table yet. A Game of Thrones the Card Game Second Edition - I really liked the first edition and the current version is getting a lot of good feedback, but my current feelings regarding the LCG system and the limited cash to support multiple games means that I haven't taken the plunge. The Prodigals Club – to win you have to lose it all. I actually own this game but still haven’t got round to playing it but the combination of theme and solid mechanics are making me look forward to it. I truly believe that RESISTOR_ needs a mention on any best of 2015 list. I played a prototype Kickstarter version for my review, but now the final production copy has come through I am happy to say that nothing had to change, it's still a tense two player puzzle of a game. 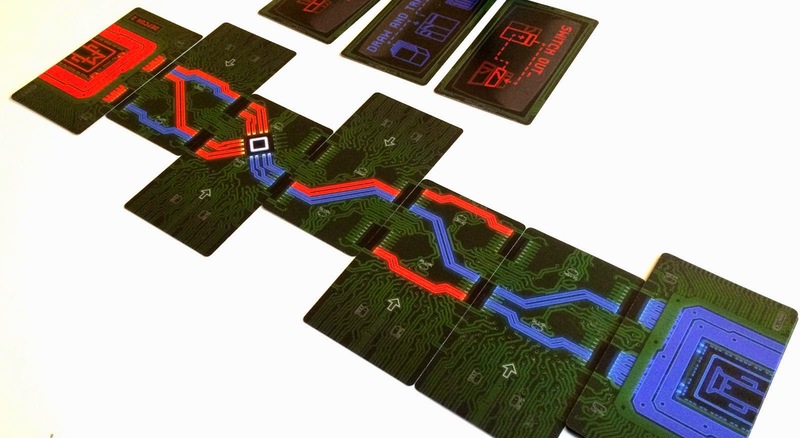 RESISTOR_ is all about manipulating circuit pathways in an attempt to hack your opponent, while he or she is trying to do the same to you. It's that cartoony approach to hacking, like Hackers or Tron, and thankfully not that realistic and depressing Mr Robot style. RESISTOR_’s ace up its sleeve is the way it manages to crank up the tension as the game progresses. When you start, it's difficult to build the pathways you need, due to the large number of cards on the table. But as the game progresses cards get removed, making it easier to hack and be hacked. This leads to a natural crescendo, as point scoring becomes faster and faster and subsequently the importance of every move becomes critical. It’s a fantastic two player game that manages to cram a lot of tactics into a short time. The big joke is that SCAPE, should really be called Escape, but the extra E kind of screws up the game mechanics. It’s the Great Escape as US and UK air force pilots try and dig their way out of the German WWII prisoner of war camp. Amongst the pilots there will be a bit of friendly rivalry but everyone has to avoid upsetting the German SS Officer who will be doing his best to stop the entire escape effort. SCAPE is wonderfully simple to play, and largely involves either playing one of the five S, C, A, P or E cards in an attempt to complete the tunnel or forcing players to swap, discard and other underhand methods to try and work out who your teammates are. I would currently call Star Wars X-Wing Miniatures game (to give it its full title) my favourite game of all time. It combines tense dogfighting and out-manoeuvring with my favourite film licence and cool miniatures and so I was suitably hyped for the release of Star Wars Armada. Armada takes things to a different level, not only increasing the scale of the battle but also reducing the speed, taking the concepts of X-Wing but replacing the intense opportunistic combat with something more strategic and genteel, and it works. Not only does Armada capture the slow careful placement of trying to turn the gajillion tonnes of metal that is an Imperial Star Destroyer into firing position, but it also captures the intense small ship-to-ship fights that are so synonymous with Star Wars. 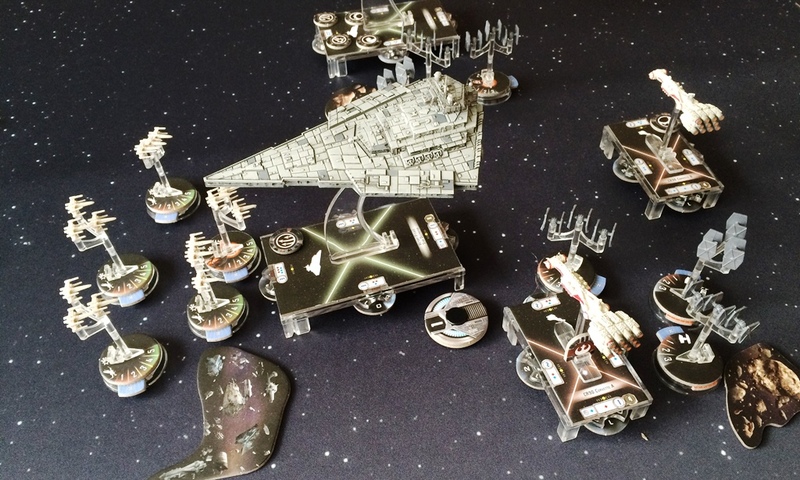 It comes at a cost mind you; Armada ship models are much larger than their standard X-Wing counterpart, moving out of the impulse pocket money purchase and into a more careful investment territory. The core set is painfully thin on hardware considering is hefty £80 price tag but the game itself is a superb evolution from fighter pilot to admiral. Specter Ops. That is the correct way to spell it according to the box, but it’s driving my UK based spell checker nuts, so from now on I’m referring to it as Spectre Ops, that way it will cause me less stress. And stress is something you’re going to be under while playing this game. You will either play as a sneaky secret agent, attempting to destroy a number of targets around a futuristic Bladerunner-esque city, while a team of hunters attempt to, well carry out their job description and hunt you down. Both sides are armed with an array of gadgets and gizmos but its pure cunning that wins the day here, whether you’ve managed to out manoeuvre the hunters or corner the agent it’s all about outthinking your opponent. At lower player counts the game can seem a little one sided, but where Spectre Ops really shines is at the maximum five players. Here one of the hunters is also a double agent, feeding his teammate iffy information to lead them off the sent. It leads to maximum paranoia as the hunters argue and the agent attempts to use the resulting confusion to slip away. There's a lot to like in Blood Rage. The end of times is upon the Vikings and the Clans are in competition to gain the most glory in the eye of the gods. It's a blend of many game styles, card drafting, area control, combat and quests and tied together in a great theme and amazing miniatures. Unfortunately there's a niggling issue that stops Blood Rage from being perfect. It feels far too easy for a player to gain the lead and once there it's difficult for other players to catch up. One of the interesting aspects of a Blood Rage is that attacking the leader can often lead to them getting more points so it can be rather difficult, even counter initiative as a method to take down the leader. There's also an issue with end of game scoring where the top players get rewarded a second time for being in the lead, resulting in some fairly ridiculous final scoring. I'm sure with a bit more familiarity the problems I currently have can be minimised but even with these issues Blood Rage is still a fun game to play and the design is full of 'oh that's clever' moments. The French really have cornered the market on whimsical, and it doesn’t get more whimsical than exploring floating teapot islands looking for treasure while helming a steam-powered flying bath tub. Celestia is a simple push your look game. Can the captain overcome the perils ahead? Or will you abandon ship and grab some treasure while you can. It’s one of those games that go beyond what’s happening on the board to around the table as you make jibes, lament the failures and put your trust in your fellow captains and hope to gain some juicy treasure. Celestia is a light game which there’s room for it in everyone’s collection. 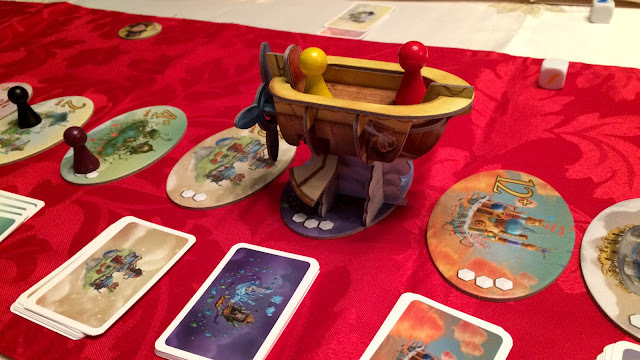 It’s a game that can be played by anyone, and the little steam ship and beautiful artwork means it also looks great on the table top. When making a board game of a licence, especially a video game, you have to abstract things just enough to translate it to the table top without losing the essence of what makes the original such a draw. XCOM does exactly that, changing a video game that concentrates on base management and tactical combat and turns it into an innovative cooperative game about managing the XCOM forces. 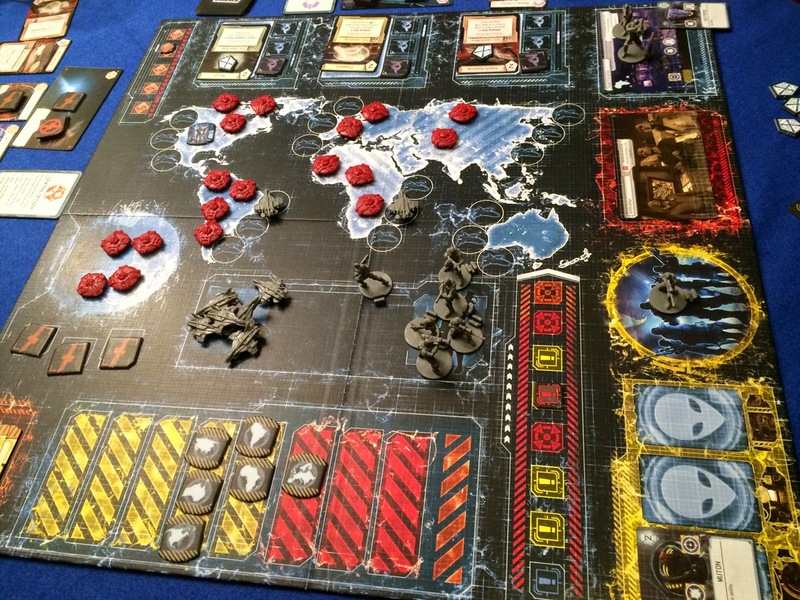 Each player takes on a different role in the XCOM system and players are independently responsible for deploying ground forcing, intercepting UFOs, researching new technology and, perhaps most importantly, balancing the XCOM ledgers so the organisation doesn’t go bankrupt. The stand out aspect of XCOM is the use of an app to run, and time, the game. It integrates itself fully into the table top experience to the point where XCOM is impossible to play without a tablet or laptop handy. Not only does the app control all the random elements, such as where aliens will invade next, it also forces time limits on all the players' action cranking up the tension. If I have a problem with XCOM it's that there's not enough variety in the way the game plays. True there are a number of different alien types and increasing difficulty levels but after a few games, which are at least 4 to play all the different roles, you will have seen most of what the game has to offer. Even so it's a brilliant implementation of the XCOM licence into a tense and innovative cooperative experience. Fantasy Flight Games have done well by the Warhammer 40,000 licence. Relic and Conquest are both great games in their own right and Forbidden Stars is another fantastic addition to the roster. 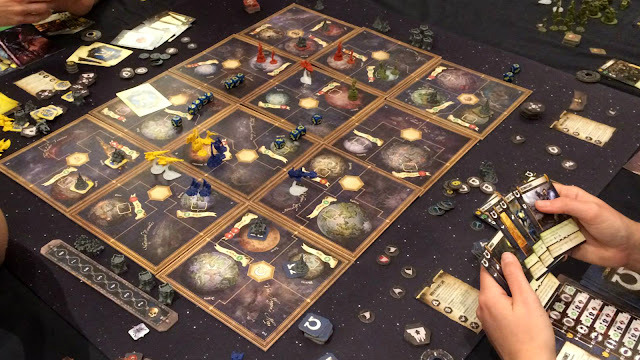 Using the now defunct StarCraft Board Game as a jumping off point, Forbidden Stars is a blend of tactics, resource management and upgrades into a deep 3X board game experience (there’s no exploring as the map is set out at the beginning of the game). It does however have one issue. The combat system, although riveting to be a part of with its multi layered system of dice, upgrades and units, is slow, boring and an excellent opportunity for a toilet break or a chance to brew yourself a fresh cuppa if you're not involved. It's also a game that rewards knowledge, understanding the vast cache of upgrade cards will give a better clue as to how to approach your game and a player familiar with all the upgrades with have a distinct advantage over those who do not. Even without these issues it’s a great “dudes on a map” board game and has a really clever order system, which requires some real tactical brain melting to take full advantage of. T.I.M.E Stories, or Source Code the board game as I like to call it, is a cooperative time travelling adventure full of puzzles and tension. As a team you will travel back in time to unravel some form of mystery in the nick of time. It plays out like a board game equivalent of a point and click adventure game, like a cardboard equivalent of Zork Nemesis or Myst. It's not without issues, suffering from an absolutely terrible rulebook that forces you to guess at several rules and important clues being mis-translated. The most controversial aspect however is that each adventure can only be played once. Being a puzzle you can't replay the scenarios and with only one scenario in the box, you can't help but feel that publishers Asmodee and Space Cowboys are being a bit miserly. But even with the down sides, T.I.M.E Stories has been the most intense gaming experience I've had this year. The way it pulls together the adventure and mystery elements is truly innovative and the tension and puzzle solving far outweigh the game's issues. It's a game that is painfully simple to explain, merely give word association clues to your team mates so they can identify the friendly and enemy spies in a grid of words. But it works. The team based nature means you need at least four players but get together six or eight people and you’re in for a treat. The real fun in Codenames doesn't come from people getting the answer right, but for the arguments that ensue when players interpret the clue wrong but are adamant of their word association abilities. The more people you have involved the more this confusion takes over and the harder the spymaster has to work to get a good clue. It’s a game that can be played with literally anyone, even though Codenames has become the darling of the board game hobbyists it deserves to achieve wilder appeal. It takes moments to teach and because everyone wants to have a go at being the Spymaster, you’ll have played 4 games before you realise. It's not very often I play party games but we make time to play Codenames at every single game night, because it's quick, simple to teach and lots of fun.